If you seek peace, if you seek prosperity for the Soviet Union and Eastern Europe, if you seek liberalization: Come here to this gate! Mr. Gorbachev, open this gate! Mr. Gorbachev, tear down this wall! President Reagan’s challenge to Soviet Premier Mikhail Gorbachev remains one of the most dramatic calls for freedom in our time. Thus I was heartened to find a passage from Reagan’s speech on the sample of the new Advanced Placement U.S. history exam that students will take for the first time in May. It seemed for a moment that students would be encouraged to learn about positive aspects of our past rather than be directed to focus on the negative, as happens all too often. But when I looked closer to see the purpose for which the quotation was used, I found that it is held up as an example of “increased assertiveness and bellicosity” on the part of the U.S. in the 1980s. That’s the answer to a multiple-choice question about what Reagan’s speech reflects. 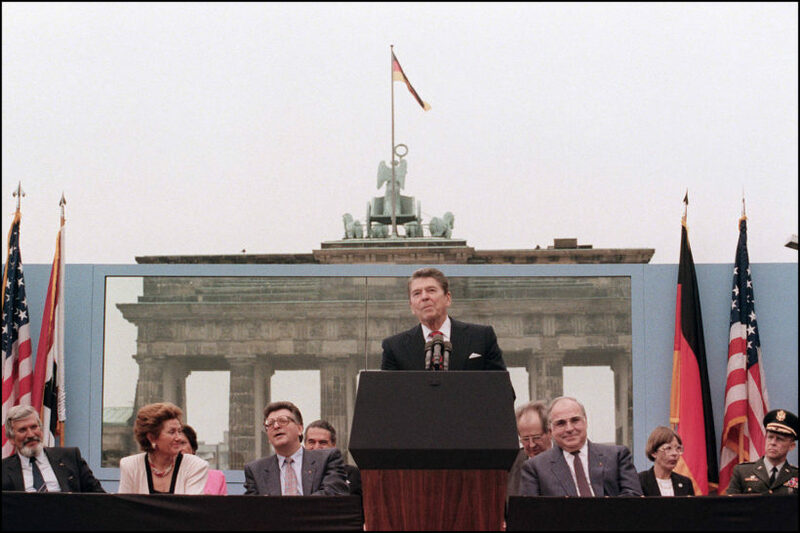 No notice is taken of the connection the president made between freedom and human flourishing, no attention to the fact that within 2½ years of the speech, people were chipping off pieces of the Berlin Wall as souvenirs. Instead of acknowledging important ideas and historical context, test makers have reduced President Reagan’s most eloquent moment to warmongering. The AP U.S. history exam matters. Half a million of the nation’s best and brightest high-school students will take it this year, hoping to use it to earn college credit and to polish their applications to competitive colleges. To score well on the exam, students have to learn what the College Board, a private organization that creates the exam, wants them to know. No one worried much about the College Board having this [real] power over curriculum until that organization released a detailed framework – for courses beginning last year—on which the Advanced Placement tests on U.S. history will be based from 2015 onward. When educators, academics and other concerned citizens realized how many notable figures were missing and how negative was the view of American history presented, they spoke out forcefully. The response of the College Board was to release the sample exam that features Ronald Reagan as a warmonger (a person who wants a war or tries to make other people want to start or fight a war). It doesn’t stop there. On the multiple-choice part of the sample exam, there are 18 sections, and eight of them take up the oppression of women, blacks and immigrants. Knowing about the experiences of these groups is important – but truth requires that accomplishment be recognized as well as oppression, and the exam doesn’t have questions on subjects such as the transforming leadership of Martin Luther King Jr. The College Board’s framework requires that all questions take up sweeping issues, such as “group identity,” which leaves little place for transcendent (exceptional) individuals. Men and women who were once studied as inspirational figures have become examples of trends, and usually not uplifting ones. The immigrant story that the exam tells is of oppressed people escaping to America only to find more oppression. That many came seeking the Promised Land – and found it here – is no longer part of the narrative. Critics have noted that Benjamin Franklin is absent from the new AP U.S. history framework, and perhaps in response, the College Board put a quotation from Franklin atop the sample exam. Yet not one of the questions that were asked about the quotation has to do with Franklin. They are about George Whitefield, an evangelist whom Franklin described in the quote. This odd deflection makes sense in the new test, considering that Franklin was a self-made man, whose rise from rags to riches would have been possible only in America – an example of the exceptionalism that doesn’t fit the worldview that pervades the AP framework and sample exam. Evangelist Whitefield, an Englishman who preached in the colonies, was a key figure in the Great Awakening, an evangelical revival that began in the 1730s. Here, however, he is held up as an example of “trans-Atlantic exchanges,” which seems completely out of left field until one realizes that the underlying notion is that we need to stop thinking nationally and think globally. The College Board thinks our history is simply part of a larger story. Why would the College Board respond to criticism by putting out a sample exam that proves the critics’ point? Perhaps it is a case of those on the left being so confirmed in their biases that they no longer notice them. Or maybe the College Board doesn’t care what others think. Some states are trying to get its attention. The Texas State Board of Education, noting that the AP U.S. history framework is incompatible with that state’s standards, has formally requested that the College Board do a rewrite. The Georgia Senate has passed a resolution to encourage competition for the College Board’s AP program. If anything brings a change, it is likely to be such pressure from the states, which provide the College Board with substantial revenue. I learned an important lesson, one worth repeating today. The curriculum shouldn’t be farmed out, not to the federal government and not to private groups. It should stay in the hands of the people who are constitutionally responsible for it: the citizens of each state. Mrs. Cheney, a senior fellow at the American Enterprise Institute, writes about history. Her most recent book is “James Madison: A Life Reconsidered” (Viking, 2014). Published April 1, 2015 at The Wall Street Journal. Reprinted here April 9, 2015 for educational purposes only. Visit the website at wsj .com. 1. The purpose of an editorial/commentary is to explain, persuade, warn, criticize, entertain, praise or answer. What do you think is the purpose of Lynne Cheney’s editorial? Explain your answer. 2. What problem does Ms. Cheney identify in her commentary? 3. What solution does she suggest? Instead of acknowledging important ideas and historical context, test makers have reduced President Reagan’s most eloquent moment to warmongering. The immigrant story that the exam tells is of oppressed people escaping to America only to find more oppression. That many came seeking the Promised Land – and found it here – is no longer part of the narrative. Why should students, parents and teachers be concerned by these facts?